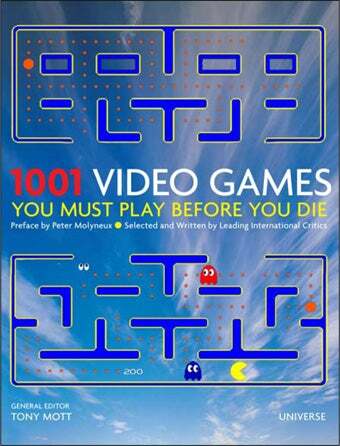 Coming this October from Universe Publishing, 1001 Video Games You Must Play Before You Die sounds like the sort of book that could seriously chew up your free time from now until you die. Compiled by an international team of critics, 1001 Video Games You Must Play Before You Die is a collection of chronologically-ordered games from the 70s to 2010 that you probably don't have to play before you die. It's not like you're going to keel over if you don't play Space Invaders or Grand Theft Auto. Actually, you are going to keel over if you don't play them. Or if you do. Death is inevitable. Perhaps the publisher should rethink the title. Edited by longtime Edge editor-in-chief Tony Mott and packed with screenshots and reviews, it sounds like the book would make for some excellent bathroom reading, or the inspiration behind a video game playing online journal, in the same vein as that movie about Julia Child. 1001 Video Games You Must Play Before You Die is coming out in October. You can preorder it now at Amazon on the slightly cheap.